Last Tuesday, Ryan Lee’s film, “Flying the Coup,” was released on Studio Anansi Tv. 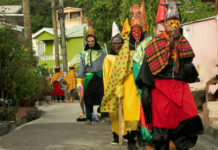 The film, which premiered at the 2014 Trinidad & Tobago Film Festival, was a winner of the People’s Choice Award – Short Film. The film was shot in both Trinidad & Tobago, while Ryan was a student in the UWI Film Program. We vibed with Ryan, on making the film and on his views on filmmaking in the Caribbean. CARIBBEANFILM: Tell us what this film is about and why you chose to tell this story. RL: This film tells the story of two young men on the opposite sides of the law, who are caught in Port-of-Spain during the attempted Coup of 1990 in Trinidad & Tobago. They must set aside their differences and work together to escape the city. Stories about the coup always had a special interest to me. I was a child when it happened so a lot of the stories went over my head. As an adult these stories intrigued me, even more so when I happened to work on a radio documentary about the coup. After the documentary I decided I wanted to tell a story about the events inside the Red House (the Parliamentary building at the time) during the coup for my Screenwriting class but maybe my pitch was less than perfect or people just weren’t interested but I was “encouraged” to bench that story. Determined to tell a story about the coup I naturally gravitated to the only thing I really knew…Comedy. RL: Your vision is always greater than the final product, I would say. The original script had more characters, locations and even an explosion in slow motion. Sadly, this was a student film so corners had to be cut so everything got scaled back to be practical. RL: I wouldn’t say there was one aspect more challenging than the rest, but the budget is one area that definitely stands out. We had a rather small budget from school to work with and we tried to use it as frugally as possible but in the end I still had to use my own funds to get the film completed. CARIBBEANFILM: What do you want the audience to take away from the film? RL: I would be happy if viewers would leave with a smile on their face after seeing the film, but I would be even more satisfied if it would raise awareness of the coup. It’s part of our history. These stories make us who we are. We should never forget them but accept as part of what makes us unique and appreciate it. RL: Growing up I was always surrounded by cameras. I would sometimes go to any one of the camera studios my cousins and uncles operated. So from a very young age, I was exposed to capturing images on film. Later on, I worked at a couple of the studios. Weirdly enough however, I went to school to do audio engineering first and it was during the 5.1 surround sound module of that course, I found film again. I came back home and eventually enrolled in the UWI film programme (with a detour of Technical Theatre happening before) and that’s why we have Flying the Coup; my final year film. RL: While I love coming up with stories I want to tell, if I had to choose one aspect I would definitely choose Directing. Putting all the pieces of the story together in a compelling way isn’t easy work but the satisfaction you feel when the final piece is done is like no other, especially when viewers are fully engrossed in it. RL: I actually have an idea for a feature I would love to make if budget was no issue, for a couple years now. I’m not going to give away the idea for the film though but I will say that even if I had an unlimited budget I would still love to use local talent especially when telling local stories as is the case with all my stories so far. At the end of the day, I’m from Trinidad & Tobago,so the stories I can tell the best, come from here. I won’t pretend to be an expert on Russian stories or stories from Africa. At the end of the day however, if you tell stories with universal human appeal it won’t matter where it originates. CARIBBEANFILM: Currently, there is a sort of awakening in the Caribbean to filmmaking as a form of artistic expression … you are a part of this “new wave”… can you share with us your thoughts on what is currently happening and where you see this energy leading filmmakers? Is there much of a difference between what’s happening in the French Caribbean as opposed to the English and Spanish Caribbean? RL: Caribbean film has really been taking off and it’s great to see! Even though throughout the islands we make speak different languages we mostly share similar historical backgrounds and these backgrounds help shape our stories and films today. I think we need to use this shared history, which is different from Latin America, to move forward on the global scene. We need to continue to push our content out there and make a name for the region so we can break away from our current content grouping of Latin America & the Caribbean. We may be small in number, but by putting in the effort to create quality content true to our narrative and working together, I believe we can make a name for ourselves and give the Caribbean recognition it deserves. RL: I think that is a question being asked more and more lately. It’s an interesting point for debate by people much more intelligent than me and with more time on their hands. I do believe it’s hard to categorize a “Caribbean film aesthetic” as something specific, that confers to specific conventions and rules. however, if a director from the Caribbean tells a story about the life they face in a European country does that make it “less” Caribbean? If an American team makes a film set on the beaches of Antigua does it become a Caribbean film just because it was shot there even if the story wasn’t about us? What is also important to keep in mind is that as an emerging film market, we have taken inspiration from more established film industries around the world. I believe that while we don’t need to reinvent the wheel when it comes to making our films we should still do our best to adapt those techniques while finding a way to stay true to our stories. 1) Star Wars Episode VI: The Force Awakens (2015). The Force Awakens, while not my favourite Star Wars movie, made me feel like a child again. It reminded me of watching the original trilogy with my father when I was younger. Come to think of it, he is probably the one to blame for me falling in love with film. It was a great reintroduction to the franchise that had quite a rough go it after Episode I, II and III. I must also add, I’ve always liked stories with strong female leads for some reason. Maybe Leia left an impression on me. 2) Kiss Kiss Bang Bang (2005). I’ve always loved detective stories, especially those with different story arcs that seem unrelated in the beginning but fall together at the end. Add that together with a comical Robert Downey Jr., and a dominant Val Kilmer, and you end up with a movie you need to stop reading about and go check out yourself. 3) Disney movies/Musicals (Yes I know I cheated). Disney has so many great musicals, there is no way you could just pick one. I grew up around musicals and I still love them today. Soundtracks for movies such as Grease, Beauty and the Beast and recently Moana are all on my phone. No DJ will be hired for a family wedding if he doesn’t have the songs from Grease. That’s how serious it is! RL: It might be biased but I would say Bim (1975) is my favourite Caribbean film. The story highlights the social and racial divide in the country at the time, but what is really interesting is how some of those same divides persist in the present day society. This 40+ year old film offers us a view on the way we were so we can reflect on how we have progressed and where we want to be in the next 40+ years. The power of seeing your own country on screen is truly priceless. It forever preserves our narrative for the us to cherish and progress. RL: I’m going to cheat again here and say, I admire numerous directors and for various reasons. I won’t list all and I’ll keep it short. Martin Scorsese – His storytelling always makes me feel I’m watching a documentary in fictional form. He knows exactly what he wants out of every detail, actor, camera movement and frame. Steven Spielberg – The imagination of Spielberg is really imagination. One of the first films that really blew my mind was Jurassic Park. The detail that went into mixing practical and CG dinosaurs were amazing at the time. In other movies, his non-invasive use of oners also made me a big fan of his. Zhang Yimou – Even though he is a director the cinematography, every one of his film are truly beautiful. His use of colours and framing is among the best in the world. Edgar Wright – Mr. Wright leans more on the light hearted side of the spectrum but the way he blends visual and audio cues to the action on screen is one of his trademarks that is seldom matched in the film making community.